162 wacky, zany, you-had-to-be-there-to-believe-it baseball games later, and we’ve made it to October. Just ten teams remain, each looking to etch their names in the annals of history. Last year it was the Cubs who finally broke the longest curse known to mankind since King Tut’s tomb was discovered–and, actually, King Tut’s tomb was discovered more recently (1922) than the previous Cubs’ World Series (1908). Can the Cubs make it two in a row? Will the Indians, who came oh-so-close last season, get their revenge? Or will it be a different ball club raising the Commissioner’s Trophy? Read on to hear Standing Room Only’s World Series prediction…along with some other less orthodox auguries. Okay, clearly if I’m predicting him to strike out twelve times, I’m banking on the Yankees to win the Wildcard (sorry, Twinkies). And as far as predictions go, I’m not really going out on a limb here with this one. Judge led MLB this season with 208 strikeouts–he was the only player to eclipse the 200-mark. His K-rate is 30.7%. He recorded a strikeout in 37 straight games this season–a new MLB record. Predicting Aaron Judge to strikeout is like predicting rain to fall; it’s bound to happen eventually. But that many strikeouts? Here’s the math. If the Yankees play five games in the postseason, and Judge sees an average of four at-bats a game, that’s twenty times up to bat for the big right fielder. Twelve strikeouts in twenty appearances sounds high; it would be double Judge’s already-elevated K-rate. But Travis Sawchik of Fangraphs recently reported that Aaron Judge is one of the least-clutch players of all time, something that–if he remains true to form–will likely decrease his postseason effectiveness. Also, should the Yankees win the wildcard they get the honor of facing Cleveland’s strikeout artists Corey Kluber, Carlos Carrasco, and Andrew Miller. You’re telling me Aaron Judge isn’t going to strike out against this? I’ll eat my words about the Chris Sale trade. In the offseason, I was a skeptic; I thought Sale would struggle in his first season in Boston, and that the Red Sox rotation would fall apart. Is Sale getting tired towards the end of the season? Putting a team’s entire pitching staff on your back will do that. Boston’s rotation has been a mess. David Price has had a year to forget, Rick Porcello couldn’t follow up his impressive Cy Young campaign with anything close to competence, and Stephen Wright barely made an appearance for the Bo-Sox. Chris Sale, though, has been nothing short of dominant, posting a 2.90 ERA and a league-leading 306 strikeouts. He and Corey Kluber, in some order, will undoubtedly be one-two in the AL Cy Young vote this season, and deservedly so. So why am I once again doubting Chris Sale? Take a look at his recent numbers. Over the course of August and September, Sale has pitched to a more pedestrian 4.09 ERA. In September alone, he gave up 9 long balls and posted his lowest monthly strikeout totals. This past month Sale has allowed opposing hitters to slash .272./331./554, all season highs by a wide margin. Sale has pitched more innings than any other pitcher in MLB; it’s safe to wonder if those innings are catching up with him. Combine that with the fact that Sale has never pitched in October, and his first start will come against the top offense in baseball (the Astros scored 892 runs this season), and you have a recipe for catastrophe. Hats off to you for a great regular season, Chris Sale; now let’s see what you can do against these guys. I’m a believer in the Nationals’ offense. They got off to one of the best starts in baseball history, scoring 170 runs in the month of April. The only thing that could slow them down is injury; sure enough, down went Adam Eaton, Trea Turner, Jayson Werth, and Bryce Harper. Eaton is still out with a torn-ACL, but Turner, Werth, and Harper are back together in time for the postseason, and they rejoin a potent lineup including “Tony Two-Bags” Anthony Rendon and a rejuvenated Ryan Zimmermann to take on the World Series Champions. Tony Two-Bags feels pretty good about his offense, and so should you. The Cubs should be very worried to face Washington. Staff ace Jon Lester has struggled this season, particularly down the stretch. In his three September starts Arrieta has pitched just 10.1 innings, giving up 7 earned runs in that span. It shouldn’t be surprising if Joe Maddon opts to go with Kyle Hendricks and Jose Quintana on the road in Games 1 and 2, freeing up Arrieta to pitch at home where he has a 2.90 ERA on the year. The Cubs have the potential to slow down the Nats offense, but with their recent pitching struggles and their year-long defensive woes I don’t see it happening here. The Arizona Diamondbacks won the trade deadline with their acquisition of outfielder J.D. Martinez. Since heading down to Arizona, Martinez has slashed .304/.369/.748 to help the D-Backs clinch home-field in the NL wildcard. He’s also belted 29 home runs in that span, including 4 in a single game. If anything, JD’s only gotten better as the season’s gone on. In September, he was first in batting average and slugging percentage among qualified hitters, and fifth in OBP. For all the media coverage of Giancarlo Stanton and Aaron Judge, no one hit more September home runs than Martinez. Over the second half of the season, JD Martinez has even been worth more to his team (2.3 WAR) than MVP candidate Paul Goldschmidt (1.8 WAR). You want more proof that Martinez is going to rake? If the D-Backs win the wildcard, they’ll play the Dodgers…the team that Martinez crushed four home runs off of on September 4th. His career stats against the Dodgers rotation is promising too. He’s 3-for-8 with a double and a home run off Clayton Kershaw, and also has home runs off Yu Darvish and Rich Hill. Get on the Martinez bandwagon while there’s still room; he’s going to have an historic October. Postseason baseball is where heroes are made, often in the unlikeliest of fashions. Who would have thought on day one of the 2016 season that Rajai Davis would hit an eighth-inning home run to keep Cleveland’s hopes alive, or that Mike Montgomery and Carl Edwards, Jr. would pitch the final inning of the World Series? This year’s Cinderella boy is a bit more well-known than last year’s heroes, but his story is no-less deserving of praise. 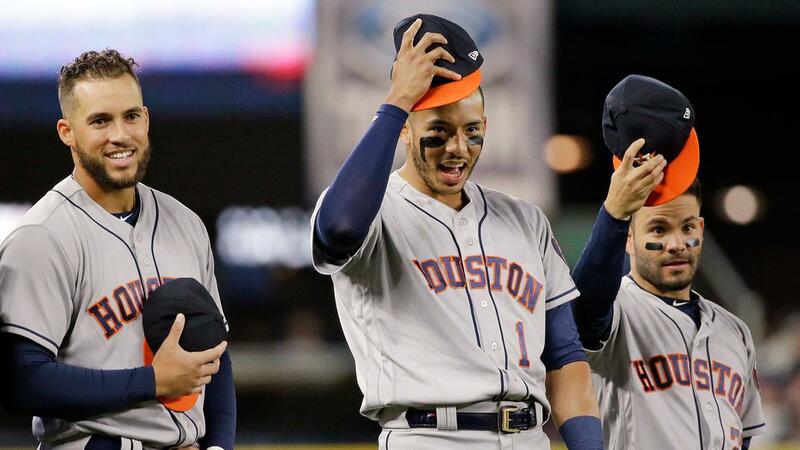 Michael Brantley was playing at an MVP-caliber level in 2014 and 2015 before a shoulder injury derailed his career; he only played eleven games in 2016. Though he again missed time with injury, Brantley bounced back to slash .301/.359/.446 in 89 games with the Tribe this season. Michael Brantley, aka Dr. Smooth, coming to steal your World Series. By their very nature postseason heroes are near-impossible to predict, but I have a good feeling about Brantley. He missed out on Cleveland’s magical run through the postseason last year, and he’ll be itching to contribute this October. Watch out for him to be a difference-maker down the stretch for the Tribe. More than any other team, Cleveland is built for October. They have the best pitching staff in baseball by ERA, anchored by a Cy Young candidate in Corey Kluber. Their staff runs deep too, with Kluber backed up by effective pitchers in Carlos Carrasco, Danny Salazar, and Trevor Bauer. Getting through the starting pitcher is no easy task, and the follow-up is even more challenging with Andrew Miller, Cody Allen, and a host of others waiting in the bullpen. Their lineup is less renowned, but perhaps even more impressive. Jose Ramirez deserves MVP consideration after a stellar 2017 campaign. The additions of Edwin Encarnacion and Jay Bruce have added more pop to the order, and Lindor and Ramirez are effective on-base machines. Best double-play team in baseball? Lindor and Ramirez are at least in the conversation, giving the Indians a strong middle-of-the-infield defense to back up their outstanding pitching staff. Defense might be the team’s biggest weakness. Ramirez and Lindor are a dynamic duo up the middle, and Yan Gomes has always rated well as a defensive catcher. But a defensive outfield made up of Austin Jackson, converted 2B Jason Kipnis, and Jay Bruce doesn’t strike much confidence. At the same time, the Indians have enough depth on the bench to give their defense flexibility, allowing Terry Francona to ride the hot hand in the lineup and in the field. Most teams would sputter after coming within a rain delay from their first World Series in over fifty years. Not this team; the longest current championship drought in MLB ends this year. Indians in six over the Diamondbacks. One year on, it’s the Indians’ turn: no rain delay magic this time. Obviously, the next round is all about postseason baseball. Wildcard action kicks off Tuesday with the Twins heading to New York to take on Luis Severino and the Yankees, then on Wednesday the Rockies battle their NL West rivals in Arizona. You can find the full postseason schedule here. In blog news, Brett and I will be launching our podcast this week! We’ll be discussing our favorite moments from the wacky and wonderful 2017 season, as well as taking a quick look at the upcoming postseason matchups. Stay tuned for more! Previous Post: Baseball Takes A Knee…Will It Take A Stand?